When there is no one but you .. The secret in this recipe is oil. Unlike butter, oil does not firm up when combined with other ingredients so it coats t he flour granules for a more evenly textured bar. The oil is the key to this bars moisture. Preheat oven to 350 degrees F. In a large bowl stir together flour, sugar, baking powder, 2 teaspoons cinnamon, baking soda, salt, and cloves. Stir in eggs, pumpkin, and oil until combined. Pour batter into an ungreased 15x10x1-inch baking pan, spreading evenly. Bake for 25 to 30 minutes or until a toothpick inserted near the center comes out clean. Cool in pan on a wire rack. 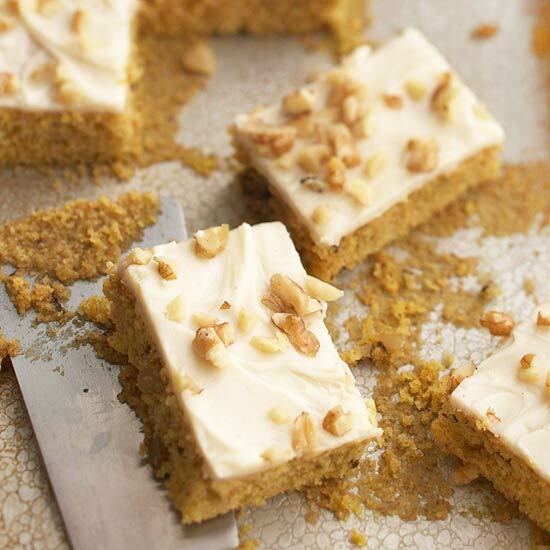 Spread uncut bars with Cream Cheese Frosting. Sprinkle with additional cinnamon and, if desired, nuts. Cut into bars. Tightly cover bars in pan with foil and chill overnight. Tote bars in pan in an insulated cooler with ice packs. Prepare as directed, except substitute one 15-ounce jar applesauce for the pumpkin. In a large bowl combine cream cheese, butter, and vanilla. Beat with an electric mixer on medium speed until light and fluffy. Gradually beat in powdered sugar to make a frosting of spreading consistency. In a small saucepan heat butter over low heat until melted. Continue heating until butter turns a light golden brown. Remove from heat. In a large bowl combine powdered sugar, milk, and vanilla. Add browned butter. Beat on medium speed until spreading consistency, adding additional milk if necessary. These look and sounds amazing!